Picturing Disney: Mondays Bite! Easy Acorn Donut Holes Recipe! 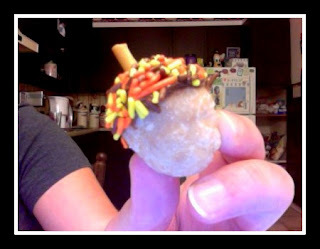 Want a fun and tasty easy Fall treat? Try this adaptation of a Disney Family Fun recipe! It’s sure to please every nut in your family tree! And it would also be a great dessert for a Chip & Dale themed party or for the Rescue Rangers fan in the house (maybe that’s a stretch but I had to give a shout out to my 90s kids in the house)! 4. Repeat for entire box of donut holes and serve!